As another Sunday evening came around, it was again time to welcome the many Pianovers who had come to network, to bond and to enjoy music together. 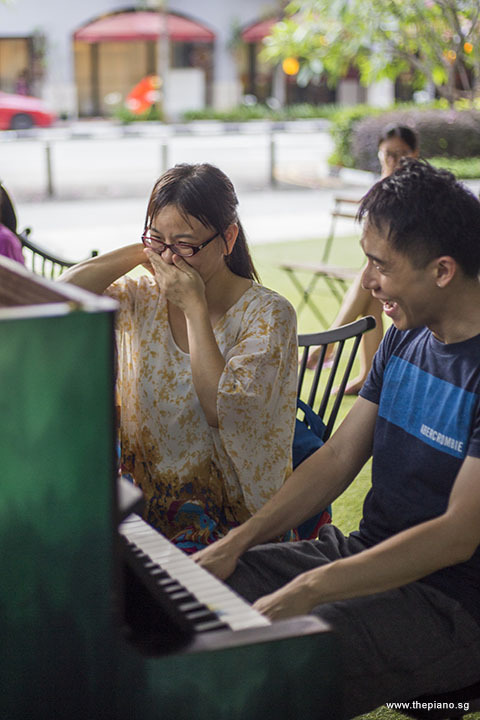 ThePiano.SG has been organising the weekly Pianovers Meetups in an effort to build a community of piano lovers in Singapore, and we are pleasantly delighted that this has been well-received. Not only do we see regular Pianovers coming back week after week, we are seeing them bringing their families and friends to join in the fun. Some Pianovers even bring their young children along in a bid to expose them to music at a young age. With even tourists and a well-known pianist Adam Gyorgy gracing our Meetup, we can’t be happier! 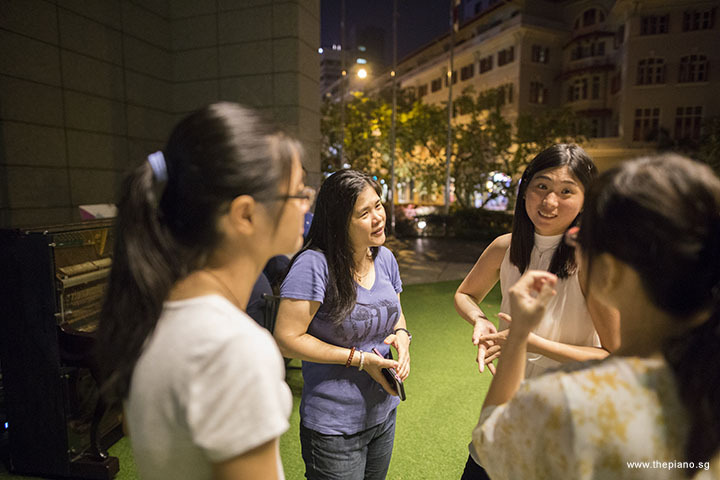 On 16 April 2017, a group of Pianovers descended on the URA Centre along Maxwell Road early. 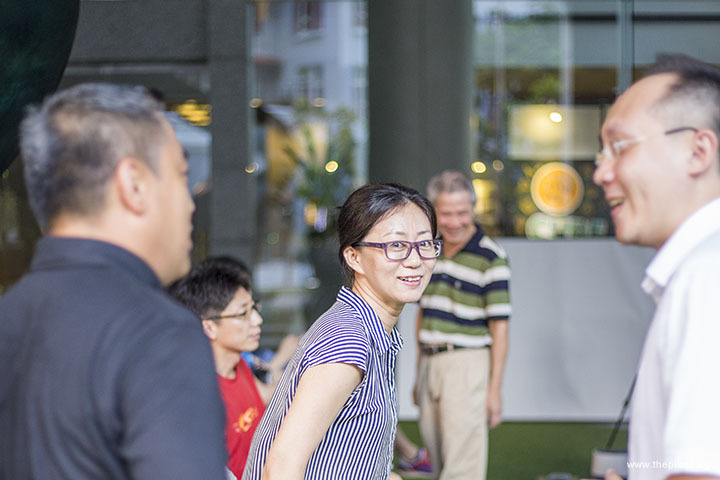 Many regulars turned up, including MJ, Corrine, Chong Kee, Jimmy, Albert, Wenqing, Gerald, as well as Vanessa and her fianc é Mitch. Also present were Siew Tin, Adelyn, Jennice, May Ling, Theng Beng, Joseph, May and her son Barrick, Gee Yong and Chris. Although these Pianovers come together and enjoy music, each of them is a unique individual, with his or her unique specialty. Siew Tin, for example, is known for playing Chinese classics, while Joseph performs Chinese Pop pieces. Together, the team of music lovers brings different experiences and talents to the Meetups. There were newcomers as well. 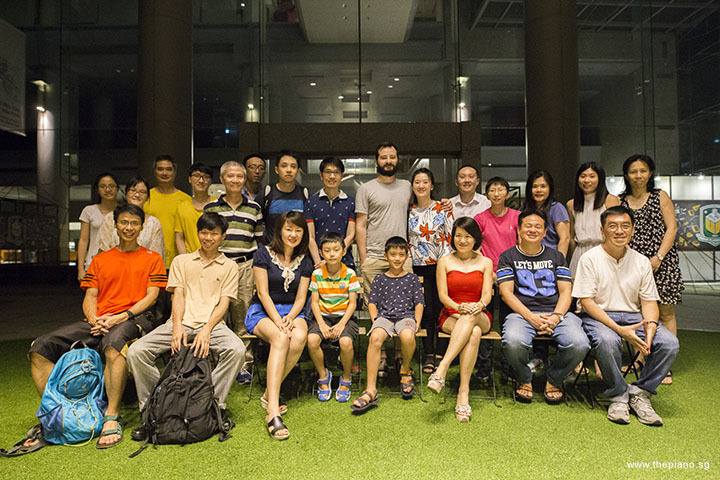 Rachel visited Pianovers Meetup with her parents Brian Liang and Madam Liu Xin. Sean Kong arrived with his parents, Steven and Laura. We were very encouraged when Rachel and Sean played the piano, along with the regulars. Many Pianovers were in a chatty mood, excited about the evening ahead. Eager to start the evening, Corrine and Wenqing were seen playing an impromptu duet as the others mingled with one another. At 6:30pm, it was time to start with the first segment of the Meetup, the Mini-Recital. Starting the Mini-Recital were Vanessa and Mitch who played Mission: Impossible by Lalo Schifrin, theme from the "Mission: Impossible" franchise, which includes the TV series, film series, and the video game series. Most people will recognise Tom Cruise as the Impossible Missions Force (IMF) agent Ethan Hunt in the movie series. Siew Tin performed 车站 by 林垂立, a very popular Taiwan Hokkien piece which was originally sung by 张秀卿; followed by the 1951 song 南屏晚钟 by 王福龄, 方謠齡. After the first Chopin's Etude "Revolutionary Etude" in Meetup #29, Chong Kee continued to delight us with the second - Étude Op. 10, No. 4 (Torrent). Torrent is a 1833 solo piano study, a very fast Presto con fuoco, which showcases continuous sixteenth notes (semiquavers), run by both hands throughout the piece. 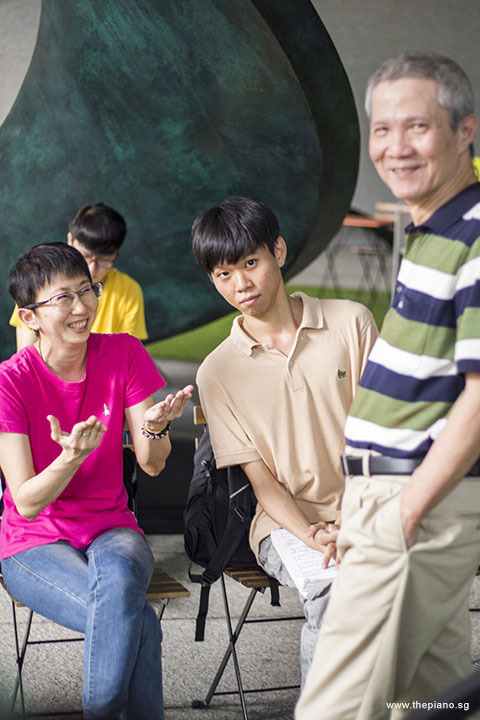 Theng Beng made his debut performance at The URA Centre today with the 1970 romantic piece Love Story (Where Do I Begin?) by Francis Lai, used in the movie of the same title. Albert, who is well known for sharing with us many famous Chinese classics, played "卖糖歌" by 李隽青, used in the 1943 movie "万世流芳"; and "忆良人" by 李厚襄. Newcomer Sean Kong, at a tender age, impressed everyone present with Toccata by Aram Khachaturian, which is a E-flat minor solo piece, and a favourite among piano students. "Toccata" is, in fact, the first movement of a three-movement suite for piano, but it became so popular that it is now treated as a separate piece, and the suite takes a seat in the shadows. We were transported next into the Japanese epic historical fantasy world of "Princess Mononoke", a 1997 anime film written and directed by Hayao Miyazaki, produced by Studio Ghibli, when Corrine played The Legend Of Ashitaka by Joe Hisaishi. Because this Meetup happened on Easter Day, Chris chose to play Jesu, Joy of Man's Desiring to match the celebratory mood and spread the message of Love and Joy. This piece is the 10th and last movement of the cantata "Herz und Mund und Tat und Leben (Heart and mouth and deed and life)" by J.S. Bach. Teik Lee, who visited us for the first time, played 她说 by 林俊杰 (JJ Lin), and seeing how he moved his body as he ran through the piece drew us deeper into his world, and we definitely would love to see him perform again! Joseph played Little Serenade by Joseph Haydn, and 月亮代表我的心 by 翁清溪 (Weng Ching-hsi), the latter being a favourite amongst Pianovers, originally sung by 陈芬兰 but made popular by Teresa Teng. Another romance piece, Sometimes When We Touch by Barry Mann in 1977, was played by Gee Yong. It was made popular by Rod Stewart in 1996, and continues to be a favourite among many. Our young Pianover, Barrick, who has been a regular in our Meetups, played Cool by Stephen J. Wood from the ABRSM 2017 - 2018 Grade 5 syllabus. He was also interested to win the tickets to Adam Gyorgy's concert on 21 April 2017, and attend with the rest of the Pianovers. Jennice played "Songs Without Words Op. 30 No. 6" (Venetian Boat Song) By Felix Mendelssohn, which is collected in the 2nd volume of "Songs Without Words". There is a total of 8 volumes in this series of short lyrical piano pieces. The second volume was dedicated to Elisa von Woringen. Julia concluded the Mini-Recital with the piece 偏偏喜欢你 by 陈百强, which was released in the 1983 album of the same title, and also used in the movie "港囧" (Lost in Hong Kong). Following the conclusion of the Mini-Recital, we moved into the Open Segment. Here was when Pianovers took to the pianos in no particular order and engaged in open jamming. 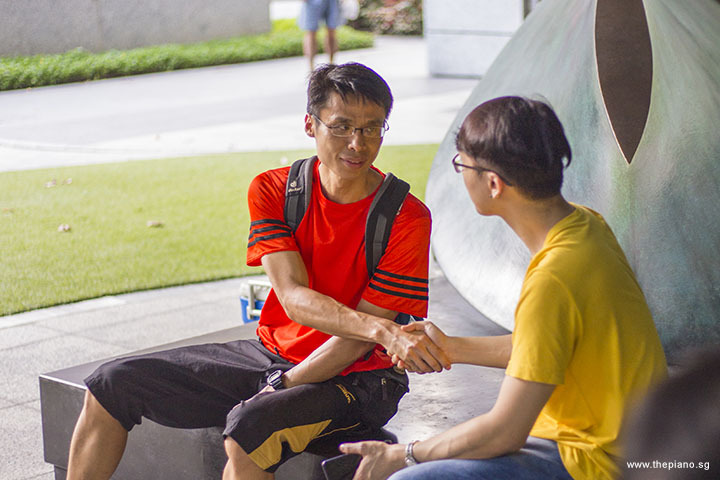 It was heartening to see Pianovers being so passionate about the piano, so open with one another and so willing to share their tips and experiences with another. 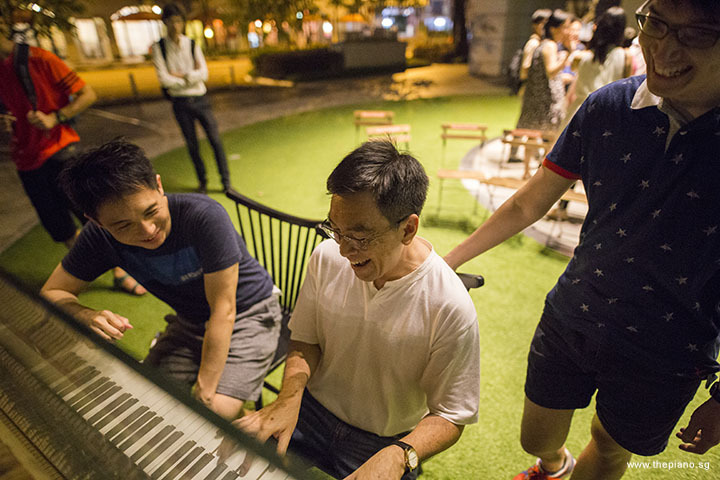 Chris was seen chatting at the piano with fellow Pianovers Wenqing and Gerald as he played a piece. 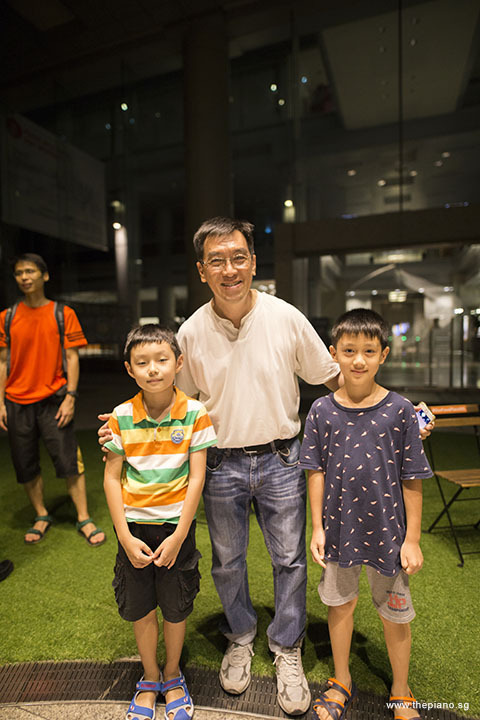 He also took a picture with young Pianovers Barrick and Sean, undoubtedly happy as the boys enjoyed a wonderful evening. The ladies had a great time too, as MJ, Adelyn, Jennice and Corrine exchanged ideas about music too. Sadly, all good things have to come to an end. As the Open Segment ended, Pianovers Meetup #34 concluded too. It had been another wonderful and fulfilling evening for all who were present. Not only was this Sunday evening a chance for the regular Pianovers get to perform and bond, it was, without a doubt, also time well-spent for the newcomers, whom we believe have been inspired and will return next week. See all of you again at the next Pianovers Meetup!